Television broadcasting is a type of broadcasting in which a TV signal is transferred by radio waves from anearthbound transmitter of a TV station to televisionviewers. The TV industry has seen a noteworthyrevolution with the advent of digital broadcasting and the Internet. With the strong penetration of Internet anddeveloping digital ecosystemsaround the globe, online television broadcasting has been expanded in the past decade. However, traditional pay television still dominates the television broadcasting services market. Cable TV broadcasting is expected to dominate throughout the forecast period. Cabletelevision broadcasting services growth is mainly supported by the older generation who spend considerable time watchingtraditional television. Majority of North Americans are still using cable TV because their pay TV subscription is bundled with their internet subscription. Apart from this, they prefer pay TV service to watch live broadcasts. In addition, cable television broadcasting services service providers are planning to provide video-on demand (VoD) services in order to maintain their position in the global market. 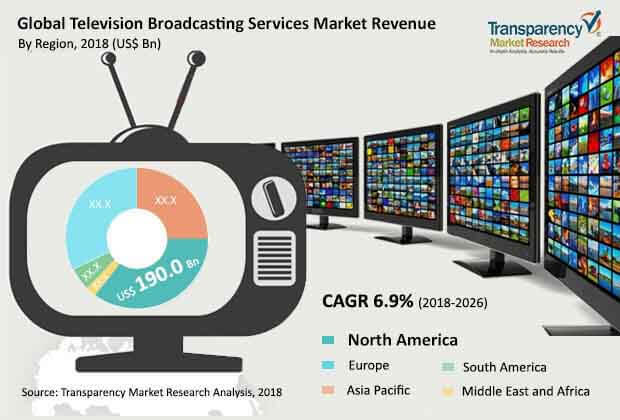 The global television broadcasting services market is witnessing strong growth owing to factors such as increasing demand for high definition (HD) content and advertisement as a growing source of revenue. At present, OTT services and production studios have huge demand from consumers and therefore broadcasters are highly focused on creating large volumes of higher-quality content. Traditional broadcasting medium provided low quality data; however, with technological advancements and advent of new technologies and streaming media devices, IoT has made availabilityof high quality content feasible. Therefore,continuous advancements in broadcast and media industry is also a major factor expected to create new opportunities for the television broadcasting services market.Apart from this, growing transition from analog to digital transmissionisalso a significant factor fueling the growth of the television broadcasting services market across the world. The global television broadcasting services market is anticipated to expand at a CAGR of 6.9% during the forecast period 2018 to 2026 and was valued atUS$ 418.1 Bnin 2017. Government bodies of different nations have different broadcasting and content regulations. Therefore, television broadcasters must comply with legal requirements. Thus, strict and intangible rules of different economies are anticipated to limit the reach of television and it could hamper the market growth during the forecast period. The adoption rate of Internet services such as IPTV and OTT in developed nations such as Europe and North America is estimated to increase substantially in the next few years. Thus, most television broadcasting service providers are highly concentrating on providing on-demand solutions for next-generation HD television and IPTV services. Apart from this, broadcast experts are unceasinglyproviding cloud-based solutions for managementand production while in delivery, broadcasting service providers are migrating to the large web-scale cloud vendors.Cloud based services offer agile, flexible, scalable, and reliable distribution to meet consumer demands, such as the explosion of devices, or hike in popularity during live events.Companies are focusing on offering technologically advanced and scalable solutions. For instance, in December 2017, Amagi launched a cloud based TV delivery platform in the U.S. It has changed the way broadcasters deliver the content. Charter Communications, which recently acquired Time Warner Cable also providesa cloud platform for content delivery.Sling TV is already involved in offering cable like service in the cloud for around US$20 per month. The global television broadcasting services market includes different players such as A&E Television Networks, LLC, AT & T, Inc., British Broadcasting Corporation, CANAL+ GROUP, CBS Interactive, Channel Four Television Corporation, CenturyLink, Inc., 21st Century Fox, Comcast Corporation, Canadian Broadcasting Corporation, Heartland Media, LLC, RTL Group, Time Warner, Inc., Tivo Corporation, and Viacom International, Inc. Growing digitalization (digital migration) and consumption of digital content has changed the medium and mode of these being consumed and/or delivered to customers. Amidst this space, across the television industry, there has been swift shift in the demand and supply trend. These changes are driven by both push from regulatory changes and technology augmented cost effective solutions and services. This report by Transparency Market Research provides insights to how the ecosystem has evolved over the forecast period spanning a term of ten years, viz. from 2016-2026. Right from providing analysis of changing capital investment patterns by telcosto providing demand oriented consumption patterns of TV broadcasting services, the report ensures that a holistic approach for market analysis is adhered to, enabling stakeholders to make informed strategic decisions. The demand estimates of the television broadcasting services market has been broadly analyzed by segmenting it on the basis of platform, which includes the following segments - Digital Terrestrial Broadcast, Satellite Broadcast, Cable Television Broadcasting Services, Internet Protocol Television (IPTV), and Over-the-top Television (OTT). Based on the service provided, the market has been analyzed for two major categories – Public broadcasters and commercial/private broadcasters. Typical examples of commercial broadcasters include companies such as American Broadcasting Company, CBS Interactive, and Comcast Corporation (NBC). To further support market analysis and help build deep understanding of growth dynamics, the report provides the following analyses – Impact of Multi-channel Network over Television Broadcasting Services, Analysis of Linear Television Consumption, Industry Infrastructure Spend Analysis (US$ Bn), Porter’s Five Forces Analysis, Television Broadcasting Services Ecosystem Analysis, Market Attractiveness Analysis, and Competition Matrix providing matrix of competitive positioning of key players as per select parameters. Analysis of industry infrastructure spend has been detailed out on the basis of the following components - third party broadcast products & services vendor spend and in-house spend. Third party spend covers ‘Traditional broadcast products & services’ and ‘digital ecosystem category, IT commercial off-the-shelf (COTs)vendors & cloud-service providers.’ This spend analysis has been provided in terms of % share for years 2012, 2017, and 2026. Overall growth trends of industry spend has been included for the period 2012-2017 as historic trend analysis and 2017-2026 as forecast.